Public Safety Project™ | Promoting effective and efficient public safety policies and exposing counter-productive policies and practices. Former El Segundo, California City Councilman Mike Robbins authored, printed, and distributed citywide an information flyer documenting and exposing evidence of a pay-for-play scam by the El Segundo Unified School District (ESUSD). The scam, ESUSD Bond Measure ES, will jack up property taxes paid by El Segundo homeowners, renters, and other property owners west of Pacific Coast Highway (PCH, formerly Sepulveda Blvd.) by more than a quarter billion dollars, and enrich the out-of-town and out-of-state special interests that make money from school bond tax hikes, and that funded the Measure ES campaign with many $5,000 and $10,000 campaign contributions. Here is a link to a PDF file of that flyer. The content of that flyer appears below. Vote “NO” on Measure ES ! THIS GRASSROOTS FLYER PROVIDES THE FACTS THE SCHOOL DISTRICT IS HIDING. These facts are from government public record information. See PublicSafetyProject.org. Special interests often receive a MILLION TAX DOLLARS for every THOUSAND DOLLARS they contribute. They don’t donate $5,000 to $10,000 each to get nothing in return. Measure ES Campaign: Organized by a school board member and a former city treasurer who resigned in disgrace; Managed from Oakland; Slick mailers designed, printed, & mailed in Berkeley. ALL of the School District’s TAXPAYER COST NUMBERS are OPTIMISTIC ESTIMATES! By Law, ES authorizes unlimited property tax increases to secure the bonds for the “investors”. Total homeowner/renter/taxpayer cost of up to $368 MILLION for principal and interest! $193,428,000 estimated taxpayer cost for principal and interest is wildly optimistic. Legal maximum cost to taxpayers is FOUR TIMES THE AMOUNT BORROWED: $368 MILLION. Renters pay property taxes passed on to them in their rent as an overhead cost. By law, ONLY 25 CENTS OF EVERY DOLLAR IS GUARANTEED to be spent for schools! $92 MILLION for schools, and up to $276 MILLION in interest to hand-picked “investors”, without a competitive bid to determine bond interest rates, durations, and sales fees. 12% Maximum Legal Interest Rate for up to 40 Years! That’s what “at legal rates” means in ballot statement. ESUSD violated E.C. §13119 by not disclosing bond duration in ballot statement. We are Still Paying 13.899%, 9.704%, and 8.09% for previous ESUSD Bonds until 8/1/2033, 8/1/2025, and 8/1/2027, respectively. ESUSD regularly sells Risky Capital Appreciation Bonds that exploit taxpayers. They pay no principal or interest for a span of years, add unpaid interest to the principal, & pay interest on interest. ES will spend MILLIONS on computers and technology that will be obsolete and trashed or recycled in 3 to 5 years, and finance it at up to 12% for up to 40 years, secured by our homes! Bond Money WILL BE SPENT ON SCHOOL EMPLOYEE SALARIES AND BENEFITS. Measure ES text states: “Proceeds of the bonds may be used to pay or reimburse the District for the cost of District staff” (salaries & benefits – see back side & TransparentCalifornia.com). “Citizens’ Oversight Committee” is a farce: Hand-picked by School Board using District recommendations, serves at will of School Board. Last one disbanded before all money was spent. Past Annual Audits DID NOT STOP ESUSD from VIOLATING the LAW on use of Tax Money. ESUSD VIOLATED laws against spending taxpayer money on political campaigns. E.g., contract approved 2/14/2017 with True North Research, Inc. for campaign polling & communications. School District spends operating and maintenance money on lavish salaries, benefits, and pensions, then cries “poor”, “leaky roof”, & “unsafe” to guilt taxpayers into paying double & triple. School Board Member William Watkins, a retired ESUSD teacher & administrator with 40 years of service, gets a CalSTRS pension of $138,830 per year for life with $2,127 annual COLA raises. His pension paid him $931,920 for 2011-2017, and ~ $2 Million for 2001-2017, mostly from taxes. School Board Candidate Paulette Caudill, a retired ESUSD teacher & teachers union member with < 35 years of service, gets a CalSTRS pension of $91,077 per year for life + $1,535 COLAs. School Board Member Nancy Cobb, a retired ESUSD teacher & teachers union member with 17 years of service, gets a CalSTRS pension of $40,170 per year for life + $680 COLA raises. She organized the YES on Measure ES campaign scam, with all the contributors below. Most of the $81,000 in Measure ES campaign contributions are from out-of-town and out-of-state businesses that make money from school bond tax hikes. Some worked on Wiseburn high school in E.S. Silver Creek Industries below sold 4 modular classroom buildings to ESUSD and wants to sell more. Atkinson, Andelson, Loya, Romo & Rudd, Cerritos, CA 5,000.00 AALRR.com ESUSD’s law firm – probably paid over $1 Million with our tax money. Silver Creek Industries, Perris, CA 1,500.00 Silver-Creek.net Sold 4 modular classroom buildings to ESUSD approved at 2/14/2017 ESUSD Board Meeting. Authored & Paid for by Mike Robbins, El Segundo Public Safety Project, PO Box 2193, El Segundo, CA 90245. Former El Segundo City Councilman Mike Robbins distributed a flyer throughout the City of El Segundo, California to expose the evidence of pay-for-play to fund the campaign for El Segundo Unified School District (ESUSD) Bond Measure ES. ESUSD School Governing Board Member Nancy Cobb, a former ESUSD school teacher and teacher union member, set up the campaign committee “Friends of El Segundo Schools-Yes on Measure ES 2018”, FPPC I.D. #1407827, to receive and spend many $5,000 and $10,000 campaign donations from out-of-town and out-of-state businesses that make money from school bond tax hikes. These businesses include architect, planning, construction, construction management, building inspection consultant, and network and technology companies. The campaign expenditures reported in the second FPPC 460 filing show the School Board Member’s Measure ES campaign is being managed out of Oakland, California, and the multiple slick campaign mailers were designed, printed, and mailed in Berkeley, California, a long distance away from El Segundo in southern California. Courtesy, Past Due, and Penalty Notices (913 KB PDF file) from the Los Angeles Registrar-Recorder/County Clerk to the the campaign committee’s treasurer, Chris Powell. Chris Powell is a former ESUSD School Board Member. He is also a former City Treasurer who resigned in disgrace after it was learned that he made repeated violations of the sacred trust placed in him. Chris Powell and others with questionable backgrounds endorsed El Segundo Ballot Measure A, which was eleven tax hikes in one ballot measure, on residents and businesses. The Yes on Measure A campaign claimed Measure A was “Supported by People You Know and Trust”, until Mike Robbins distributed a flyer and posted information on the PublicSafetyProject.org website proving otherwise. Have the Measure A Supporters Earned Our Trust?– scroll down where Chris Powell is mentioned. 11/27/2012 email from resigned City Treasurer Christopher Powell via City Clerk Tracy Weaver admitting to his extra-marital affair (30.2 KB PDF file). For more information, Mike Robbins can be contacted at 310-322-7244. Click HERE to see the “Clinton Cash” documentary movie for FREE over the Internet on Breitbart.com before you vote. See the great “Hillary’s America” documentary movie in a theater before you vote, and before it goes away, to learn the secret history of the Democratic party that explains their lust to accumulate and abuse power. 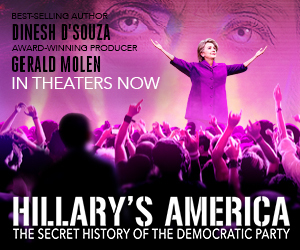 Click HERE to find a theater showing Dinesh D’Souza’s “Hillary’s America” documentary movie. Vote for Donald Trump because the future of the Supreme Court and our Constitution are at extreme risk if Hillary Clinton wins. Hillary Clinton will appoint leftist activist Supreme Court justices who will “reinterpret” the Bill of Rights, including the First, Second, Ninth, and Tenth Amendments, in absurd ways to render them meaningless and eliminate our most important freedoms. Vote “NO” on all Tax Measures. All taxes combined are much too high, and customers pay the business taxes that are passed on to us as a cost of doing business. The liberal tax-and-spend politicians must learn to live within our means. Vote “NO” on the measure to ban the Death Penalty for Terrorists and other Mass-Murderers. Vote “YES” on the measure to speed up the Death Penalty for Terrorists and other Mass-Murderers. Good evening. I am Mike Robbins, a 33-year El Segundo resident and a former El Segundo City Councilman. First, I want to thank outgoing Mayor Pro Tem Carl Jacobson for his many decades of service to the City and the citizens of El Segundo, as Mayor, as Mayor Pro Tem, as Councilmember, on the Planning Commission, and in other capacities. I had the privilege of serving on City Council with Carl Jacobson as mayor. We agreed on most issues, but when we disagreed, I always knew he was honest, intelligent, competent, and doing what he believed was in the best interest of the City and the citizens of El Segundo. Second, I would like to congratulate the newly elected City Council Members, Don Brann, Carol Pirsztuk, and Drew Boyles. The City Council election turned out the way I believe will be best for our City. I am disappointed with the passage of Measure B, the 50 percent increase in the Hotel Transient Occupancy Tax. I hope that increase in City tax revenue will not trigger a clause in the union contracts to give automatic additional COLA pay raises to the City employees. Such a clause existed in the previous union contracts. Third, I realize that the City Council meeting where the new Councilmembers are sworn in is meant to be brief and celebratory in nature. However, there is an item on the City Council agenda to change the way the mayor and mayor pro tem are elected, without a vote of the citizens of El Segundo to make that change. That item has many flaws that must be considered. Any change in the way the mayor and mayor pro tem are elected should be based on what is best for the citizens of El Segundo, and should be put before the voters of El Segundo. All of the pros and cons of such a change should be carefully considered before putting the question before the voters. Recall that un-elected Mayor Bill Fisher, and outgoing Councilmembers Marie Fellhauer and Dave Atkinson, were all defeated in their reelection campaigns in part because of their violating El Segundo’s longtime tradition that the Mayor is elected to a two-year term, and absent good cause for removal, should serve a full two-year term. At present, the mayor and mayor pro tem are elected by the new City Council members every two years, at the meeting after the City election where the newly elected Council members are sworn in. This system is a middle of the road compromise between having the mayor directly elected by the people to a four year term and having rotating mayors with one-year terms. I believe it will not serve the voters of El Segundo well to change the term of Mayor and Mayor Pro Tem from the current two years, which is half a City Council term, to one year or less. I believe the disadvantages outweigh the advantages. Here are some of the disadvantages. First, the additional and specialized experience and knowledge gained during the first year as mayor will be lost with each annual rotation. Second, it will break continuity. It will reduce the ability of the mayor to develop continuity in leadership, and to cultivate relationships and influence on behalf of the City with other government entities throughout the region. Third, it will result in an ongoing Lame duck Syndrome for half to all of the one-year mayoral term. The mayor will not be taken as seriously by other elected officials in and outside El Segundo, and by City employees, if the mayor has a term of only one year. The mayor and mayor pro tem will only be ceremonial positions. And fourth, if a councilmember turns out to perform very well as mayor, the mayor will or may be changed in only one year instead of two years. The proposal for the City Council members to select the mayor based on the number of votes each received may seem reasonable, but it too has flaws. Different elections have different voter turnouts. And the number of votes received depends on how many seats are up for election, how many candidates are running, how much money is spent on the campaign by each candidate, and by the police and firefighter unions who usually support candidates and ballot measures based on their own financial interests at the expense of the taxpayers. In this last election, one candidate, Don Brann, started out recovering from a serious injury that hindered his walking door to door, which undoubtedly cost him many votes. Also, a candidate can get elected with the most votes by getting mostly each voter’s third vote. This occurs when there are two opposing factions and a candidate is viewed as unsatisfactory to voters in each faction, but not as unsatisfactory as the candidates in the other faction. FPPC campaign disclosure forms show the police and fire unions spent an overwhelming $39,247.50 in our city election ($19,033.50 police, and $20,214.00 fire) to influence voters on Measure B and the City Council race. See PublicSafetyProject.org. The May 3, 2016 El Segundo City Council meeting began with a proclamation, a commendation, and a presentation recognizing the Election poll workers for their valuable services rendered to the City of El Segundo during its April 12, 2016 General Municipal Election. Next was a roll call, followed by public communications. Former El Segundo City Councilman Mike Robbins spoke, thanking Mayor Pro Tem Carl Jacobson for his decades of service to the City and citizens of El Segundo, congratulating the newly elected City Council members, and opposing agenda item L-8 to change the traditional method of electing the mayor and mayor pro tem and their terms. That agenda item, requested by Councilman Mike Dugan and Councilwoman Carol Pirsztuk, would change to a rotating mayor and mayor pro tem selected by the City Council with only one-year terms. The old City Council then conducted a minimal amount of City business, including approving the minutes from the April 19, 2016 City Council meeting. They adopted a City Council Resolution certifying the final election results, declaring the winning candidates, and declaring that Measure B, the 50 percent increase in the Hotel Transient Occupancy Tax (TOT), was passed. Then the traditional American peaceful transition of power took place. Outgoing Mayor Pro Tem Carl Jacobson and City Council Members Marie Fellhauer and Dave Atkinson said their goodbyes, received gifts and recognition certificates, and stepped down from the dais in the City Council Chamber. Marie Fellhauer showed off her very young adopted baby again. And a video was shown on the big screen on the Council Chamber wall recognizing Carl Jacobson’s decades of service as the city’s mayor, mayor pro tem, council member, and in other capacities. Deputy City Clerk Mona Shilling administered the oath of office to reelected City Clerk Tracy Weaver. She ran unopposed and easily won reelection. City Clerk Weaver then administered the oath of office to reelected City Treasurer Crista Binder who also ran unopposed and easily won reelection. City Clerk Weaver then administered the oath of office to newly elected City Council Members Drew Boyles, Carol Pirsztuk, and Don Brann, who then took their seats on the dais where each gave a brief speech. Then it was time for the new City Council to choose the new mayor and mayor pro tem from among the Council members. I suspected there were two but not the necessary three votes (out of five) to choose Suzanne Fuentes for her second two-year term as mayor. I also suspected that three or four members of the new City Council, including Suzanne Fuentes, Mike Dugan, Carol Pirsztuk, and possibly Drew Boyles, wanted to be mayor and there might not be three votes for any of them. I was curious to see what would happen. Councilman Don Brann started the process by quickly nominating Suzanne Fuentes for mayor. Fuentes just served a two-year term as mayor. Councilwoman Carol Pirsztuk nominated Councilman Mike Dugan. There was a vote for Fuentes, which failed with only two out of five votes, with Brann and Fuentes voting yes. Then there was a vote for Dugan, which also failed with only two out of five votes, with Pirsztuk and Dugan voting yes. The Assistant City Attorney, who attended the meeting because City Attorney Mark Hensley could not attend, suggested that Suzanne Fuentes remain as mayor since there was no change of mayor as a result of the insufficient votes to choose a new mayor. There was a Council consensus to accept his recommendation and keep Fuentes as mayor. Mayor Fuentes then nominated Councilman Don Brann for mayor pro tem. There was also a nomination for Councilman Drew Boyles for mayor pro tem. The vote for Brann failed with only two out of five votes, with Fuentes and Brann voting yes. Then there was a vote for Boyles, which passed. Next, the City Council discussed agenda item L-8, requested by Mike Dugan and Carol Pirsztuk, to change to a rotating mayor and mayor pro tem with one-year terms from the traditional mayor and mayor pro tem selected by a vote of the new City Council after each city election, with two-year terms. The Assistant City Attorney stated that the City Council could adopt an ordinance to implement that change if it so desired. He said the City Council could direct that an ordinance be drafted, that the item be studied further and brought back to City Council at a later date, or that it be tabled. There was some discussion. Mayor Fuentes opposed the change. Mayor Pro Tem Boyles stated he originally thought it was a good idea, but after additional research, he is no longer sure and it would require further study. Don Brann had nothing to say on the agenda item. Mike Dugan moved and Carol Pirsztuk seconded to direct the City Attorney to draft an ordinance to implement the proposed change and come back to City Council with it. The motion failed 2 to 3, with Dugan and Pirsztuk voting yes, and Fuentes, Boyles, and Brann voting no. The item was tabled. Thus, for the next two years, the City of El Segundo’s mayor is Suzanne Fuentes and its mayor pro tem is Drew Boyles. The following letter to the editor was published in the El Segundo Herald newspaper (HeraldPublications.com) on Thursday, April 21, 2016 in the Letters section on page 3. The El Segundo Herald has a strict 250-word limit, including the title. The Police Officers’ and Firefighters’ Associations (unions) bankrolled the Measure B tax-hike campaign. FPPC campaign disclosure forms show the police and fire unions spent an overwhelming $39,247.50 in our city election ($19,033.50 police, and $20,214.00 fire) to influence voters on Measure B and the City Council race. This is nearly four times the $10,000 they contributed to the “Yes on Measure A” campaign in 2014, for eleven tax hikes, on residents and businesses. The fire union probably spent more than $100,000 on their Measure P campaign in 2012, to outsource our local Fire Department to Los Angeles County for a reduced level of service, for their own financial benefit. None of the firefighters and only about one-fourth of the police live in town. They campaign in our local elections to maximize their pay and pensions, and raise taxes and fees to pay for it, no matter how excessive and unsustainable. The latest available El Segundo City Employee compensation data, for 2014, at TransparentCalifornia.com, shows the 58 sworn police employees had the following total annual pay and benefits statistics: Minimum=$139,028; Maximum=$358,536; Average=$228,240; and Median (half above and half below)=$214,867. The 44 sworn firefighter employees had the following total annual pay and benefits statistics: Minimum=$148,235; Maximum=$375,524; Average=$247,646; and Median=$225,882. The firefighters are paid to sleep and eat, including some of those hours at the overtime rate of 150% their regular pay rate. The union campaigns have nothing to do with safety and everything to do with union greed. I would like to assure Marie Fellhauer’s campaign supporter, Jenica Brigham, that I do exist. I am not “the same person” as Mike Robbins as she claimed in her insulting 4/7/16 Herald letter. Brigham attacked me, Mike Robbins, and others with childish name-calling and other baseless personal attacks because we reminded voters of Fellhauer’s record on City Council. She used personal attacks because she could not disprove any of our facts about Fellhauer’s true record. Brigham claimed the residents “think everything should be free.” In fact, we don’t want to be charged twice for the same things, such as $1,850+ fire department ambulance transport fees when taxes already pay for our fire department. Brigham described herself as “a young woman”, apparently to attract young voters to vote for Fellhauer. But at age 38, she hardly qualifies as “a young woman”. By 38, you’d think she would have registered to vote. She is not even registered to vote in El Segundo, at least not as of 2014. Another Fellhauer campaign supporter, Beth Schodorf, submitted a letter calling accurate descriptions of Fellhauer’s City Council record a “smear campaign”. Now who’s doing the smearing? Schodorf even defended Fellhauer by attacking Lou Kutil. That was a mistake. For many years Lou Kutil, an elderly resident himself, has volunteered his own time and money to drive elderly residents to their doctor appointments, wait for them, and drive them back home. Many thanks to the Voters of El Segundo for electing candidates last week to aid existing City Council members in continuing the positive changes started two years ago…well done El Segundo voters! Updated on April 28, 2016 by Michael D. Robbins. 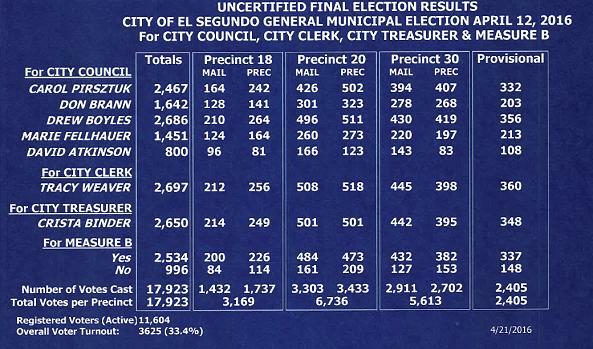 The uncertified final election results are in for the April 12, 2016 El Segundo General Municipal Election. 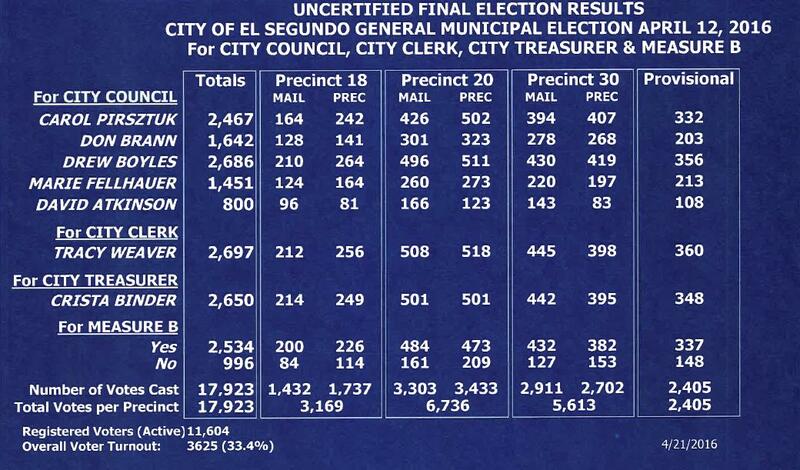 They will be certified when the current City Council adopts a City Council Resolution certifying the final election results at the next regular El Segundo City Council meeting on Tuesday, May 3, 2016. The meeting will be held in the City Council Chamber at City Hall, starting at 7:00 PM. The traditional peaceful transition of power will then be made, with the outgoing City Council members stepping down and the newly elected City Council members being administered their oath of office by the City Clerk, and then stepping up to assume their seats at the dais in the City Council Chamber. The City Clerk will chair the City Council meeting until the new City Council votes to choose the new mayor. The Mayor will then chair the meeting, and the City Council will vote to choose the Mayor Pro Tem. The final vote counts, campaign spending, and cost per vote for each candidate and for Measure B are provided in the tables below. The remaining uncounted ballots were canvassed and then counted by machine today, Thursday, April 21, 2016, at City Hall in the West Conference Room near the City council Chamber. City Council candidate Don Brann, the only candidate that could possibly lose the election after winning in the election night preliminary vote count, was present with his campaign staff to observe the counting of the remaining ballots. As expected, the election outcome has not changed from the election night preliminary vote count. As previously reported, 543 ballots remained to be counted. Those were provisional ballots cast at the polls on election day, and vote-by-mail ballots postmarked by election day and delivered to City Hall before the first Friday after election day or held for delivery until Monday because City Hall is closed every Friday. The uncounted ballots were canvased and counted today, Thursday, April 21, 2016 at City Hall in the West Conference Room near the City council Chamber. 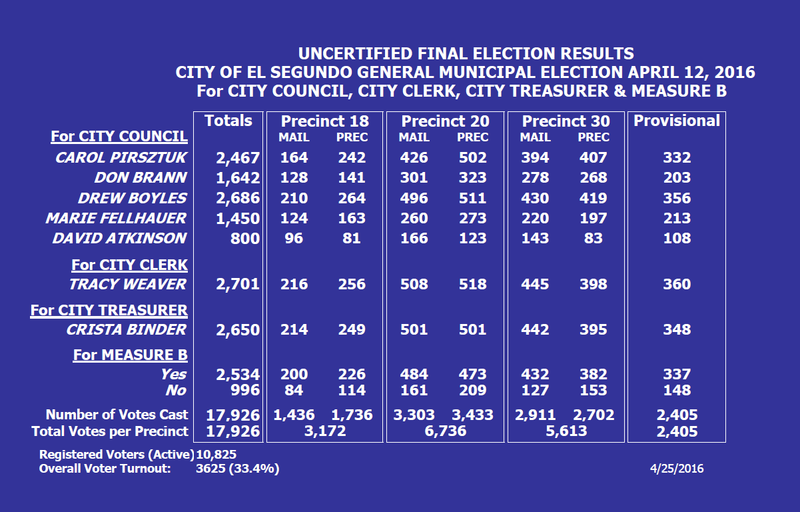 Here are the uncertified final election results for the April 12, 2016 City of El Segundo General Municipal Election for City Council, City Clerk, City Treasurer, and Measure B.
Uncertified final vote count from a PDF file posted on the official City website at ElSegundo.org. Click the image to see a larger image. The following table summarizes the final vote count and campaign spending for each City Council candidate and for Measure B, the 50 percent increase in the Hotel Transient Occupancy Tax (TOT) from 8 to 12 percent. Union Spending and Total Spending columns are higher than the amounts shown, due to total ESPOA and total ESFA campaign spending being substantially higher than the amounts they itemized in their FPPC Forms for the three City Council candidates and for Measure B. The Union Spending amounts for candidates assign the entire cost of a slate mailer to all three candidates rather than one third of the cost to each candidate, on the basis that each candidate gets all or most of the benefit of the entire cost of the mailer. The incumbent candidates were Marie Fellhauer and Dave Atkinson. Challengers must spend considerably more campaign money than incumbents to level the playing field, due to the many advantages of incumbency, including name recognition and more frequent contact with potential campaign supporters. Challenger candidate Don Brann served on City Council from 2008 to 2012, but he did not run for reelection and he lost name recognition over the following four years. Also, he was recovering from a leg injury and lost considerable time walking door-to-door during the beginning of the campaign, before vote-by-mail ballots are received by voters. The amounts are rounded up or down to the nearest dollar to improve readability. The following table summarizes the final vote count and cost per vote for each City Council candidate and for Measure B. Union Spending and Total Spending amounts used in calculations, and therefore the Union Cost Per Vote and Total Cost Per Vote columns, are higher than the amounts shown, due to total ESPOA and total ESFA campaign spending being substantially higher than the amounts they itemized in their FPPC Forms for the three City Council candidates and for Measure B. This post was updated on April 28, 2016 by Michael D. Robbins to include the uncertified final vote count after the manual count (by hand) of Precinct 18 (to audit the machine count from one precinct), as received from the El Segundo City Clerk’s office and posted on the City website. The original vote counts after counting the provisional ballots and remaining vote-by-mail ballots, but before the manual re-count of Precinct 18, is given below. They were superseded by the new uncertified final vote count information after the manual re-count of Precinct 18, which is given above. The following vote counts were changed by the manual re-count of Precinct 18: City Council candidate Marie Fellhauer went from 1,451 to 1,450 votes, and unopposed City Clerk candidate Tracy Weaver went from 2,697 to 2,701 votes. The PDF file pointed to by the link on the City’s website at ElSegundo.org was replaced with an updated file at the same link. 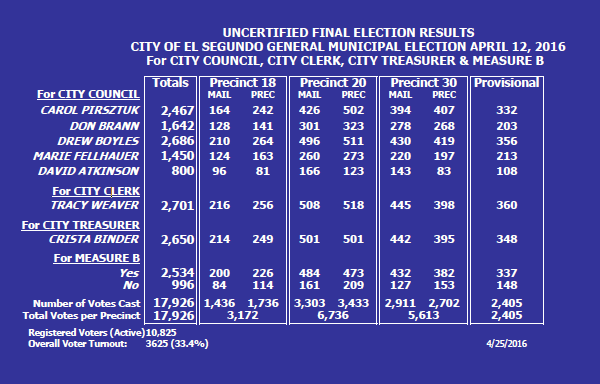 Here is the uncertified final election results for the April 12, 2016 City of El Segundo General Municipal Election for City Council, City Clerk, City Treasurer, and Measure B. Note that the 33.4% figure for Overall Voter Turnout in the bottom line of the chart appears to be incorrect, as 3,625 divided by 11,604 is 0.3124, or 31.2%. What are Provisional Ballots, Why are They Useful, and Who Should Use Them? California state election law allows voters to request and vote a provisional ballot at a poll on election day if their name and address do not appear on the roster of registered voters at that poll, or if their name and address are marked as a voter who was sent a vote-by-mail ballot. Did not also vote and send in a vote-by-mail ballot which would be a duplicate ballot. Provisional ballots and vote-by-mail ballots are verified in the same way. The signature on the envelope of a provisional or vote-by-mail ballot is compared with the signature on the voter registration card. And it is also verified that the voter did not vote both a provisional ballot and a vote-by-mail ballot. After the provisional ballot is verified, it is removed and separated from the envelope to maintain the privacy of how the voter voted, and it is counted towards the final election vote totals. In some jurisdictions, uncounted provisional ballots and vote-by-mail ballots may not be counted if they are insufficient in number to change the election results, i.e., which candidates and ballot measures won or lost. The reason cited is to save money. However, every vote should be counted, even if it won’t change the election outcome, both as a matter of principle, and for the practical matter of knowing by how many votes a candidate or ballot measure won or lost. Why are provisional ballots useful? Provisional ballots allow registered voters to vote at their assigned poll even if their name does not appear on the roster of registered voters, or at another poll if they don’t know their assigned poll or cannot make it there before the polls close. Provisional ballots also allow registered voters to vote at a poll on election day if they lost, did not receive, or do not have access to their vote-by-mail ballot. Who should use a provisional ballot? Any registered voter who shows up at their assigned poll and is told they are not on the roster of registered voters should request and vote a provisional ballot. Alternatively, if time permits before the polls close, such voters can find out if they were assigned to a different poll and go there to vote. Any registered voter who cannot vote at their assigned poll and goes to another poll in the same election district to vote. Registered voters who requested a vote-by-mail ballot, or who are on the permanent vote-by-mail list, and who did not receive their vote-by-mail ballot, or who lost it or do not have access to it, should go to the poll for their residential address, or another poll in the same election district, and request and vote a provisional ballot. If you do not know your polling place, go to the official website for the city clerk or county clerk for your address, or call the information phone number for the city clerk or county clerk. Note that the entire City of El Segundo is within the same election district. Posted in California, El Segundo, El Segundo Election Coverage, El Segundo News, Elections, Politics	| Tagged California, City of El Segundo, El Segundo, election, election law, provisional ballots, vote-by-mail, vote-by-mail ballots	| Comments Off on What are Provisional Ballots, Why are They Useful, and Who Should Use Them?